With the new operating system released by Microsoft, Predator has responded and released Predator DNC Version 9.0 through the Predator MES Suite v9.0. 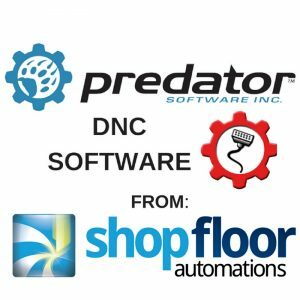 Shop Floor Automations (SFA), the largest distributor and service center for Predator Software today announced implementing the new release and training on the product. Whether using a wireless or wired network, RS232 or Ethernet, DNC can be configured to remotely upload, download and drip-feed from a single CNC Control Panel to as many as 256 CNCs, whether they are across the shop floor or across the globe. And now Predator DNC is even better with version 9.0. In addition to Windows Vista, version 9.0 also supports Microsofts other 64-bit systems XP Professional x64 Edition, and Windows 2003 Server x64 – along with Microsoft Excel 2007, Access 2007 and Oracle Database 11g. Predator DNC v9.0 also offers new Fanuc Focus connection to machines for transferring NC programs via Ethernet for uploading, downloading and drip-feeding. Plus it comes with the newly released Predator CNC Editor v9.0, which contains dozens of new features, such as several new CNC programming wizards and all new backplotting with support for Predator Dynamic Graphics. Manage your CNC programs, machine parameters, & offsets. Enjoy a wide range of CNC communication options from your Predator PCs for drip-feeding, downloading, & bi-directional communication. Upload via parallel, RS232, RS422 Ethernet, & wireless Ethernet for thousands of CNC machines. With Microsoft Office & Windows Explorer-compatible user interface (Windows 10 O/S supported), use familiar features for drag & drop, cut, copy, paste, shortcut menus, object-based menus, toolbars, tool tips, & available online help. Improve CNC revision control while using existing ERP & MES bar-coded paperwork. Eliminate time wasted walking back & forth between your CNC & PC with a Remote Request function. Consider a 32-Bit, Multi-thread, Multi-tasking, Open-Architecture DNC Software solution that works wired & wirelessly.